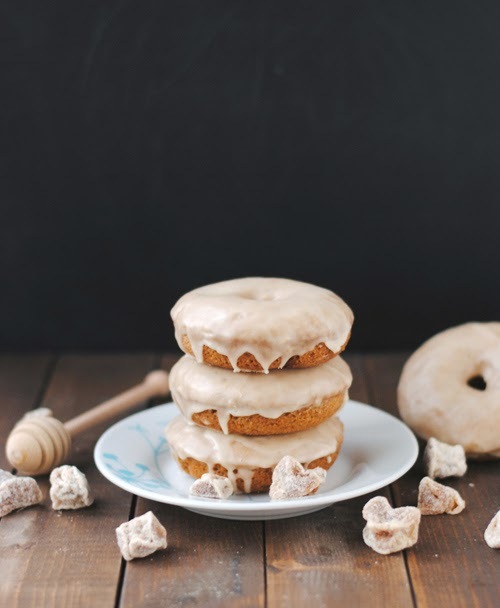 These vegan gingerbread doughnuts are, according to my boyfriend, the best thing I've ever made. That should mean something because he eats a lot of things. Mostly things I've made, so he's kind of an expert on my kitchen exports. And he's totally right: these are incredible. The spice blend gives the perfect hint of gingerbread, and reminds me that Christmas and (hopefully) snow is just around the corner. The glaze sweetens them up just a notch, and really drives home the ginger notes. All in all? The absolute best way to warm up for the upcoming holiday season. Preheat oven to 375F and grease a doughnut pan. Set aside. In a large bowl, combine all the dry ingredients (flour, sugar, baking powder, baking soda, spices, and salt) and mix them up until they're blended together nicely. Make three wells in dry ingredients, and pour the oil, vinegar, and vanilla into each well separately. Pour the water over everything and mix it all together with a fork, whisk, or whatever you've got around. This batter really isn't picky. Scoop the batter into each doughnut well, about 2/3 full, and bake for 10-13 minutes. Allow to cool slightly, then remove to a wire rack. Repeat with the remaining batter. Combine the icing sugar, syrup, and ginger in a small bowl. Whisk until well combined. Add water, one teaspoon at a time, until it's smooth and glossy, but not too runny. Dip each cooled doughnut, one at a time, into the glaze to cover one half. Set on a wire rack and repeat with each doughnut until all of them are glazed and delicious.